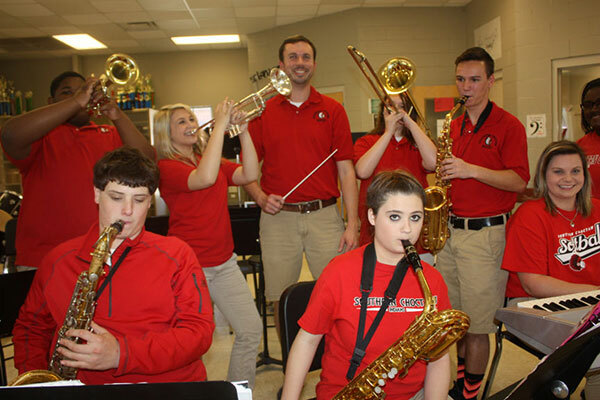 GILBERTOWN, Ala. — Southern Choctaw High School Band Director Will Pierce knew early on music was going to play a big part in his life. Wanting to educate young people and share his passion for music with them, Pierce earned a degree in instrumental music education, preparing him for a career as a school band director. Now, a decade later, his dedication to teaching is paying off. 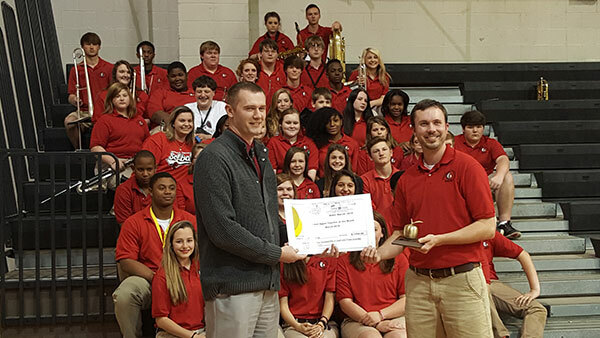 Pierce was surprised at a pep rally Tuesday when he was named the Golden Apple Teacher for March. Pierce said he was shocked when he heard his name called. "There are so many great teachers," he said. "I didn't think for one second that it would be my name they called. This validates I am doing a good job, and the students enjoy what I am doing, and are having a good time while learning in the process." Witnessing how his students react positively to music is empowering, Pierce said. "The thing I have a passion for about music is how people feel when they hear the music — the emotional aspect of it — and how they relate to it," Pierce said. "To teach kids on that level how to enjoy it, and how to learn about that, is empowering." Leo Leddon, principal of Southern Choctaw High School, said Pierce is an extraordinary teacher. "I just can't say enough good things about him," Leddon said. "He's outstanding; the kids and the parents love him. He is exceptional. I wouldn't be surprised if he isn't at a major college somewhere one day, and does wonderful things with whatever band he is leading." 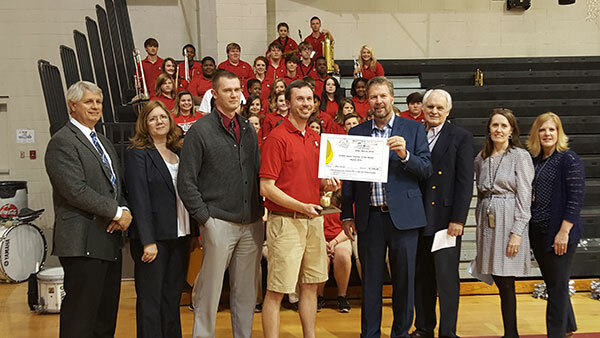 Under Pierce's leadership, the Southern Choctaw High band has gotten high marks in marching and music competitions. But Pierce says the young musicians haven't reached their full potential. "We've made superior ratings, and won a grand champion award, so I don't think this group is done yet," Pierce said. "What inspires me about this group is I know I can take them to another level. Whether it be more performances out of state, or on a national level, this group can do a lot." Senior Madalyn Kelley, who has been in the band since sixth grade, said she has learned a great deal from Pierce. "He has taught me so much in these last couple of years, and I appreciate all that he does," she said. Saxophonist Andrew McIlwain, who will be graduating this year, said he has enjoyed being one of Pierce's students. "He has done such a good job of working with us, and I am proud that he won this award," McIlwain said. "We have definitely come a long way since the beginning of the year. Because of his influence I am going to continue playing in the band in college." One big reward of his job, Pierce said, is watching students grow as musicians and performers. "Sometimes students get in the band and they are afraid of performing in front of a large crowd," he said. "Because of our family atmosphere here, the kids rely on and respect each other. I think a lot of that just helps to pull their inner spirit out and helps them to be comfortable in front of large crowds, and to just learn to love performing." Pierce also finds satisfaction when he sees a look of accomplishment in a student's eyes. "When that light bulb goes off in a student's mind as they are playing the music, and they get it, they finally understand and grasp the concept — that shows me I am doing a good job, and they are enjoying what they are doing, and it makes me enjoy what I am doing," he said. Pierce said receiving the Golden Apple award makes him want to be a better educator. "I am very honored to have received this award, it is something I never expected,"It is just what keeps you going and motivated. It will definitely motivate me to continue to do what I am doing, even going above and beyond what we do here at Southern Choctaw High School." Bounce & Cozi TV is the March Presenting Partner. 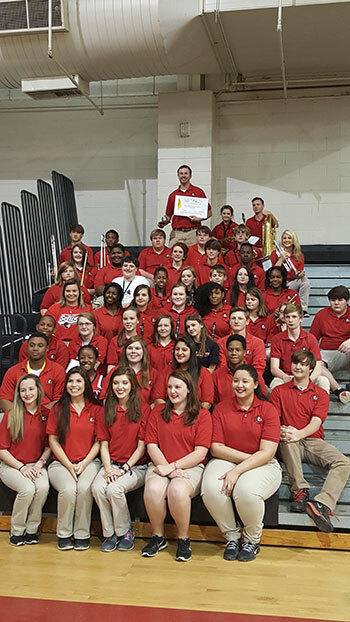 The Golden Apple is open to any educator, grades kindergarten through 12th grade who works in the following areas: Lauderdale, Neshoba, Kemper, Clarke, and Newton counties in Mississippi, or Choctaw and Sumter counties in Alabama. 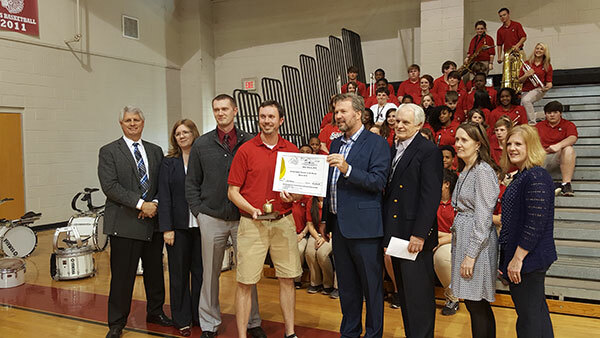 As a Golden Apple winner, Pierce received a $300 cash prize, a $150 donation to an "Adopt a Classroom" account and a large school supply donation for his classroom.